For Drs. Jess and Jake Young, getting patients to be active participants in their health care is an important part of the recipe for wellness. The doctors’ inspiration for their company name came from the University of Iowa’s black and gold colors. “Everyone’s a Hawkeyes fan,” says Dr. Jake. Dr. Jake also attended the University of Iowa for his chiropractic school prerequisites and was a TA in Neurobiology. So it’s no surprise that he has a special fondness for the school’s colors. Rather than serving as a practice that simply treats pain, Black & Gold Chiropractic & Wellness wants patients to play an integral part in their road to optimal health and wellness. Patients may, for example, perform manual traction exercises and different activities like that while in the office. The focus is on wellness and making them active and healthy. Drs. Jess and Jake also educate their patients along the way. We are wellness-oriented and want to improve every aspect of our patients’ lives, from infants to adults. We can help them nutritionally or any other way that they need. Dr. Jess finds it gratifying when patients realize that they don’t have to live with pain anymore. Dr. Jake likes to see patients’ progress and the way it changes their lives. He’s had patients who couldn’t move for years and years. After chiropractic care, they remarked how much better they felt and how much more activity they could do. 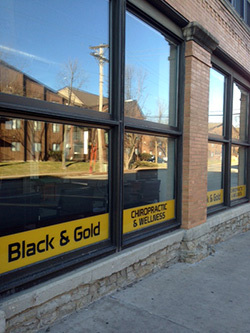 Black & Gold Chiropractic & Wellness is the only chiropractic office located in the downtown area, making it a convenient and accessible location for everyone from university students to working professionals and everyone in between. Discover how Black & Gold Chiropractic & Wellness’s wellness-oriented approach can help you get well and stay well. Call today!